Copper used for etching should ideally be about one millimeter thick and can be purchased from a variety of places in sheets of various sizes. Perhaps the best option is purchasing copper straight from a metal supplier, this gives you the best value for money and allows you to work on the plate from its most basic state. Sheets purchased like this are not specifically designed for etching but can easily be prepared for it through a number of simple techniques. The larger the sheet purchased the better the value for money. You should try your best to get a sheet with the least amount of damage possible and try your best to protect its surfaces from scratches and marks once purchased. Keep your copper safe and if possible wrapped-up with something that will protect it such as cardboard, cloth or even paper. Marking one side as the side you will use for printing as soon as you get the copper is a good idea so from that point on you can keep this side face-up or face out from the wall you are leaning it on to avoid marking. You can do this with a permanent marker. Having said all that no matter how protective you are of your copper it will always manage to get some marks on it. Don't worry too much as nearly all marks can be fixed but being careful in these early stages can save you time and effort in the long run. Copper plates (and other etching plates such as zinc) can also be purchased pre-prepared for etching from art shops. This saves you having to prepare your own plates and you can get straight into the image making. It is much more expensive buying copper like this, perhaps two or three times the unprepared price. Plates are only available in stock sizes but can be cut. Etchings can be made with printing plates of a variety of sizes with the only limitations really being the size of the press bed that you will use to print the plate and also the size of the acid bath you will use to etch the plate. The size of the plate cannot exceed either of these so keep these dimensions in mind if working with large plates. The edges of metal printing plates can be extremely sharp so be very careful not to cut yourself when handling them. The best method of cutting plates from a large sheet of metal is with a guillotine. The size of the desired plates can be ruled up and drawn onto the metal sheet with marker pen. Guillotines can be very dangerous so always be careful and preferably get a demonstration of the specific machine in use. When using a guillotine line the cut up with the blade and apply as much downward pressure to the plate on the guillotine bed as possible. This avoids slipping during the cut. It is good to have help if cutting a larger sized plate as one person can perform the cut while the other person uses their body weight to keep the plate steady. As best as possible the cut should be made in one quick motion to achieve a clean edge. Cuts can also be achieved by continuously scoring the copper with a blade. The copper must be firmly secure with the use of a strong heavy ruler to guide the blade along the cut line. The copper must be scored many times as each pass the blade cuts slightly deeper. The key to this is method is consistency and patience not strength; allow the cut to take some time, work smoothly and calmly. Specific cutting tools can be purchased for this operation but it is also possible to improvise with more commonly found hard-edge blades you can purchase in a hardware store. Plates can also be cut with a hack-saw but it is very difficult to achieve a clean, straight edge using this method and it can take some time. Edges can be filed straight afterwards but this method is not ideal. Shaped plates, such as circular plates, can also be produced and these results are best achieved with a Jewelers-saw; essentially a Coping-saw with a very fine toothed blade. Jewelers-saw blades are very thin and easily broken so keep the blade tight and as straight as possible at all times when making the cut to avoid a snap. This method can also be quite time consuming. Test cuts on a small practice sheet of metal are always a good idea whichever method you are using. The edges of etching plates need to be filed down to 45 degrees to avoid any sharp edges when going through the printing press. If the edges are not sufficiently filed they can cut both the paper you are printing on and also sometimes damage the printing blankets as well. Use a thick metal file to file a 45 degree slope on all edges of the plate on the side you will be creating your image on. Most etching metals are relatively soft and with good technique the filing should not take much time. Position the plate on the edge of a firm, secure table so the file can easily be held at 45 degrees. Clamps can be used to hold the plate in place but be careful not to damage the plate surface. If possible it is best to use your body weight to hold the plate still on the table but if using a clamp position a piece of cardboard between the clamp and the plate to protect it from scratches. The corners can be rounded if desired but are fine to be left pointy as long as all the downwards edges are at 45 degrees. When a 45 degree edge is achieved on all sides of the plate it is good to smooth these edges with a burnishing tool. Because the edges have been filed they will be quite rough and ink will easily get stuck in the small grooves giving you dirty marks on the corresponding edges of your prints. Again holding your plate on the edge of a table, use the inside edge of a burnishing tool to smooth the metal by forcefully traveling the tool along the plate’s edge from end to end. You should be able to feel and see the plate’s edges become smoother and shinier as you do this. This is a relatively quick process and if you find you have not burnished the edges sufficiently you can come back later at any time during the whole process to amend them. When etching a plate in acid any exposed sections of metal will be eaten away, this will happen on the back of the plate as well as the front. For this reason you need to cover the backs of plates before acid submersion to protect them and perhaps also to save the back side for later use. There are two main ways to protect the back of your plates. Thefirst, and easier, method is done by covering the back of the plate with contact adhesive paper(the kind used for covering books). Make sure the whole area is covered with the contact and that as few air bubbles are trapped as possible then remove the excess contact around the sides with a blade. If you use this method, once you have immersed the plate in acid and are at the stage where you are ready to print peel the contact paper off. Painting the back of Shellac is the second method. This method requires more time and equipment but is just as effective. Lean the plate up against something and using a thick brush completely cover the surface of the back of the plate being careful not to get any on the front side. The plate must be allowed to dry, brushes and equipment can be cleaned with methylated spirits, the best solvent for shellac. The back side of an etching plate can be used to create an image after the first side is exhausted or even still in use, and simply requires using these same techniques as preparing the first side. If you think you may decide to use this back side later on contact paper is the better option for its cleanliness and ease of removal. Shellac can be removed with methylated spirits and a cloth but can be a tedious process. The surface of a plate used for etching needs to be completely smooth before ground is applied. This is achieved by polishing the plate with a combination of ‘brasso’ or ‘silvo’ with steel wool and cotton rags. It is best to be diligent during this process as it is by far the best time to fix scratches and imperfections on a plate. Most marks can be polished away but Individual deep scratches that can’t be removed in this manner can be fixed now (or any other time) with a scraper and burnishing tool as well as polishing materials. It is good to remember that only marks you can feel will print. Rust marks for example can appear extremely prominently on the surface of a copper plate but don’t worry, these marks will rarely be responsible for marks on your paper. By gently and delicately stroking a suspected area of a plate with the pad of your finger or your fingernail you should be able to determine if a mark will actually hold ink and print a mark. If you can feel any disturbances as you move your finger across the suspected area of a plate, this area will need fixing either by polishing or with a scraper, burnishing tool. Be aware that even the smallest of scratches can hold ink on a plate and print a mark later on.The amount of time it takes to prepare a plate’s surface during this stage is directly related to the state of the plate, if the plate is heavily scratched, this process may take some time longer than if it is in a good condition. Combined with ‘brasso’ or ‘silvo’, it is best to use both fine and coarse steel wool as well as cotton rags to polish the plate. Start the process by gently polishing with steel wool and brasso. It is good to start with a rougher gauge of steel wool if the plate carries many scratches then move to a finer one as you progress. If the plate is in good condition you may not need to use the rough steel wool to begin with and in some cases you may be able to go straight to the rag and brasso. Always be gentle when polishing and especially with the steel wool make sure to be careful not to cause more scratch damage to the plate than you are actually removing, a lot of etching metals are far softer and easier to scratch than you might think. When polishing with ‘brasso’ or silvo using both the steel wool and the rags make sure you rub with a gentle and uniform motion. As you polish, the brasso or silvo you have applied to the plate will turn darker as some of the surface metal is removed. You will need to use a rag to remove this when it nears a black colour and then add more fresh liquid to continue polishing. The steel wool or rag you are using will also become darker and worn in the area being rubbed on the plate so make sure you alternate the surface you are using regularly to achieve the best effect. If there are some scratches you simply can’t remove by polishing you may require the use of a scraper and burnishing tool. Remember that discolourations caused by oxidization etc. do not need to be removed; only physical imperfections like scratches and grooves, continue polishing with fresh rags and ‘brasso’ until you are satisfied they are removed. Make sure the plate is as clean as possible before it is degreased, in the last step use turpentine and a clean rag to completely remove all traces of black grime, dirt and brasso from the plate. The process of degreasing an etching plate involves the removal of grease from a plate by way of applying a mixture of whiting and vinegar. There are a number of occasions throughout the whole etching process where plates need to be degreased. The plate should be placed face-up in an empty sink or basin, ideally, on a flat surface. Sprinkle whiting over the plate then next pour a small amount of vinegar over it. Using your hands mix the two substances together into a paste, this paste should fizz as it mixes together and the two substances react with each other. Rub the paste over the entire plate until it is completely covered and with a gentle motion rub the surface of the plate for a minute or so; if the consistency of the mixture is not right simply add more of either the whiting or the vinegar to obtain a ‘gooey’ consistency. After the paste has been applied to the surface of the plate and been allowed to react for a minute or so, clean the plate using water until all of the paste and its residue is removed. The only real quick and easy way to tell if the plate has been properly degreased is to apply water to it and watch for ‘beading’ as it runs off. ‘Beading’ is where water forms droplets on the plates surface as opposed to lying in a thin, uniform sheet. If this ‘beading’ is occurring anywhere on the plate simply reapply the whiting and vinegar solution and redo the process to that particular area or the whole plate. You will normally find that the edges of a plate will require more work than the plate’s center and you may have to apply the degreasing mixture several times to completely degrease the plate. When you are sure the plate is completely degreased and all the paste and the residue has been fully removed with water allow it to dry. You can use a soft window squeegee, paper towel or rag to remove excess water but however you dry your plate, be very careful not to cause any scratches or damage. Hard ground works as a complete block-out and, as its name suggests, it dries hard on the surface of the plate. This allows for delicate lines that are usually thin, wiry and blunt at the ends. Hard ground is a good option for users looking to work finely with a scribe and is ideal for this method of working. Very generally, working with a scribe on hard ground gives an impression close to that of a thin felt pen. Hard ground can be applied both in a liquid form and a solid state form that needs to be melted to be applied on a hot plate. This method of heating solid ground until melting point then applying it with a roller is probably the best option but all methods executed well will give you a good result. Hard ground must not be applied to thick or it will begin to crack and falter when worked on with a scribe and alternatively if it is applied to thin it will not work as a complete block out to the copper underneath. See the following section ‘Applying the Ground’ for detailed methods of application and troubleshooting. Soft ground is used when the user desires an effect similar to that of a pencil or crayon or wishes to make a direct impression from an object. Just like hard ground, soft ground can be applied in both liquid and solid forms. Soft ground never completely dries like hard ground and because of this you can manipulate its surface in a more painterly manner. Impressions can be made on the plate by drawing on a piece of paper that covers the ground. After the drawing is complete the paper is removed and the ground directly underneath will be lifted where pressure was applied. It is also possible to make direct impressions into soft ground with relatively flat objects such as feathers. Items like this can be pressed down into the ground by hand or placed on the plate and run through a press at a relatively low pressure to achieve a result. See the following section ‘Applying the Ground’ for detailed methods of application. There are generally two different ways to apply ground to a prepared etching plate and whether applying ‘hard’ ground or ‘soft’ ground the methods are relatively the same. Ground can be purchased and applied in two forms; liquid ground that is applied via brush or sponge onto the plate or in solid form which must be melted and rolled onto a heated plate. Liquid ground can be purchased in both ‘soft’ and ‘hard’ forms, it is simpler to manage and requires less equipment to apply than its solid counterpart. Liquid ground is best applied with either wide, soft brush or a foam brush. Lie your clean, dry, polished and degreased plate face up on a table with some scrap paper underneath to catch any overflow that may occur. Using either a regular or foam brush carrying as much ground as possible, apply the ground gently to the surface of the plate from edge to edge. The main aim is to cover the entire plate equally. It is almost as easy to paint the ground off as it is to paint it on and the process can get quite fiddly if you find yourself working on small individual areas. Because of this it is best to use a large brush fully loaded with ground moving from edge to edge. This will enable you to complete large sections of the plate relatively quickly and easily. Try to cover the plate completely but do it thinly. Ground should be applied to a thickness so the copper is completely covered but not drowned. You will find the thickness of the applied ground equalizes over the plate during the drying process to your advantage. The weather and room temperature will affect the consistency and drying time of the ground, sometimes quite dramatically. Be careful not to cover the plate too thickly as plates that carry too much ground can crack and when trying to achieve a crisp line with your scribe the ground can crumble. It is always possible to come back and fix any problems you have with the ground such as uniformity or thickness after you have applied your first coat. This can be done at any time with any size brush available. Clean your brush and equipment with turpentine or an alternative solvent when you’re finished. Applying a solid ground is the alternative to liquid ground and it also comes in both ‘soft’ and ‘hard’ forms. Using solid ground will perhaps provide you with a better result than its liquid counterpart but choosing this option requires more equipment and also makes it slightly more difficult, especially with larger plates. Solid ground comes as a solid block and must be heated until it reaches a liquid state and then rolled onto the plate in a thin layer with a roller. To use this method you will require a hot-plate, preferably one that is larger than the plate you are applying ground to, and a hard rubber roller. Make sure your plate is clean, dry, polished and degreased. Lie the plate face up on the hot-plate and allow it to heat up. As the plate heats up, touch the hard ground block onto the plate’s surface. If the ground begins to melt and leaves a stain on the plate continue to dab the ground crudely, but as equally as possible, all over the surface. If the ground does not melt and liquefy when touched to the plate it is not hot enough, in this case allow it to heat for longer or raise the temperature on your hot-plate. Ideally the temperature should be hot enough to liquefy the ground but not so hot it will burn it as this can cause the ground becoming brittle and cracking during the drawing process. Hard ground and soft ground are two different compounds that will allow you to achieve two very different results. The differences between the two grounds are explained in the next section. There are several methods for transposing images onto grounded plates which can better allow you to work from a preplanned picture. When using hard ground by far the easiest method of copying your image across to the plate is by using transfer paper. This technique allows you to sketch your image on paper (or some other mediums) until you are happy with it before moving it onto your plate. This method will not create lines in the ground that are ready for you to etch but simply transfer your image making it easily visible and simple to trace. Transfer paper or carbon paper can be purchased in most good art shops and is normally available in a variety of sizes and colours. After you have applied hard ground to your plate simply lay a sheet a transfer paper face down on the plate with your drawing face up on top of it. Fix the papers with tape so they will no slide or slip and trace or redraw the image on the paper using something like a hard pencil. Once you have completely redrawn the image remove the papers and your image should have transferred onto to plate. You can now simply use your scribe to draw over these easily visible lines with your scribe. Transfer paper will not have the same effect when working with soft ground as the surface is not hard enough to transfer onto. Impressions can be made on the plate by drawing on a piece of paper that covers the ground. Whether this sheet of paper is blank or you are redrawing over an existing image, using this technique should give you results. Etchings, and intaglio prints in general, work by a plate holding ink in small grooves and reservoirs that have been created on its smooth surface.During the inking process the plate is first completely covered with ink and thensecondly polished back to remove the excess. The flat, smooth surface of the plate is wiped cleanwhile ink remains in the fine wells and lines cut into the plate’s surface untouchable by this wiping process. This is the basis of Intaglio printing. If these ink wells are too wide or open the ink can easily be wiped out of them and no proper mark will be transposed onto your paper. When creating a drawing into the ground of a plate it is vital to keep these principalsin mind. The darkest marks possible are not created by scratching open large areas of ground or even scratching more heavily into a plate but by creating a fine ratio of wells and humps. This principle is demonstrated well during ‘aquatinting’ but the same idea of ratios of wells and humps generally apply to all mark making in intaglio printmaking.Scratching out large sections of a plate to create an ‘open bite’ is a valid and often quite charming technique but in terms of creating controllable tones it is not a good option. Below is a cross section of a plate showing that a hatching, stippling or aquatint technique (a) will allow a plate to hold far more ink than a single open area (b). Line work is generally the basis of traditional etching and an understanding of its principals are vital. There are many other techniques and methods to achieve interesting results while etching but a solid understanding of these simple principals will aid you immensely in understanding the others and general troubleshooting. When drawing with a scribe it is best to think of the process as effectively monochromatic, black or white, ink or paper. All the grays or mid-tones in an image must be blended not on the page but optically by employing techniques such as hatching or stippling. Some of these techniques are detailed in the following section. When a plate is submerged in an acid bath the exposed lines are etched deeper and deeper with time. As the lines etch deeper they will also slowly start to etch sideways as the acid reaches under the ground. When dealing with any kind of fine line work, you must be very careful that the small gaps or islands created between the web of fine lines are not degraded to the point where they are destroyed. If these sections of white or blank space are removed the effect of the hatching will be ruined. It is easy to etch too far and it is always a good idea to keep a close eye, ideally with a ‘loop’ if you have one, on these fine sections during the etching process. If mistakes are made during the mark making process they can hopefully be removed with scraping and burnishing techniques discussed in a following section ‘Scraping and burnishing’. Hatching is a technique used to create tonal or shading effects by creating a series of closely spaced parallel lines with a scribe. When a second series of lines are added and placed at an angle dissecting these first lines it is called cross-hatching. The main concept of hatching is that the quantity, thickness and spacing of the lines will affect the brightness of the overall image, and emphasize forms creating the illusion of volume. By increasing quantity, thickness and closeness, the darker the area will appear. When drawing with a scribe it is best to think of the process as effectively monochromatic, black or white, ink or paper. All the grays or mid-tones in an image must be blended not on the page but optically by employing techniques such as hatching. When a plate is submerged in an acid bath the exposed lines are etched deeper and deeper with time. As the lines etch deeper they will also slowly start to etch sideways as the acid reaches under the ground. When dealing with hatching techniques, or any kind of fine line work, you must be very careful that the small gaps or islands created between the web of fine lines are not degraded to the point where they are destroyed. If these sections of white or blank space are removed the effect of the hatching will be ruined. It is easy to etch too far and it is always a good idea to keep a close eye, ideally with a ‘loop’ if you have one, on these fine sections during the etching process. Stippling is a technique where tone and shade are created with a series of dots. Stippling is a very fine technique and commonly found in fine detailed work such as scientific illustration and botanic drawing. The main concept of stippling is that by varying the density of dots in particular areas you can affect the overall tone created. A regular scribe is a perfect tool for stippling but be aware it is an extremely time consuming method. By increasing the closeness of the dots, the darker an area will appear and just like hatching it is best to think of the process as effectively monochromatic, black or white, ink or paper. All the grays or mid-tones in an image must be blended not on the page but optically.The beauty of this technique is its wonderful fineness and ability to create soft gentle gradations in tones. As well as the themes behind stippling being close to that of hatching so are the hazards that can occur;some of these are listed in the hatching section above ‘Hatching’. Aquatint is a technique used to achieve tonal effects on your printing plate. Aquatinting works by applying a gentle mist of particles over the surface of a plate. When the dust has settled down and stuck to the surface of the plate it works as a resist to the acid and will allow you to create a variety of tones according to its density and time etched. The aquatint effect is normally achieved by applying ‘rosin’ dust but other substances can be used in its place even things such as spray paint. Rosin can be purchased from specialist art shops both in powdered form or a solid form you can crush yourself. Rosin is dust form is hazardous to your health if breathed in can accumulate in your lungs and make you very ill. When dealing with rosin dust you should always wear a good quality respirator mask. There are several ways of applying rosin dust such as with a dusting bag or even by hand but perhaps the best option is to use an ‘aquatint box’. Aquatinting boxes are substantial and large pieces of equipment and can be purchased or even hand made. Many guides and tips can be found on the internet for this task. Aquatinting boxes are sealed containers which house a small amount of rosin dust in their base. The box will also have a door closer to the top that you can open to place your plate inside facing up. Normally a fan or paddle is activated to disturb the dust inside to create a storm of fine particles inside. Once the paddle or fan is activated, after waiting a few moments, a cleaned but ungrounded plate is placed on the shelf in the box and left there for a set amount of time. As the dust storm settles it will create a fine thin layer of dust on the plate’s surface. Ideally the plate should be about 50% covered with an even settling of dust but this can vary due to the effect desired. The dust can be quite hard to see and it can be a big help to use a loop or magnifying glass to make sure you have a good coverage on the plate. The density of particles present and results achieved with aquatint boxes can vary dramatically and normally requires substantial experimentation before the ideal result is achieved. When this process is complete remove the plate from the aquatint box. Be very careful not to touch or disturb the freshly laid surface, it is very delicate at this point. The rosin dust now must be melted to adhere it to the surface of the plate. This is done by slowly heating it up from underneath, ideally with something like a bunsen burner. A hotplate can be used but something more mobile and accurate is preferable to better regulate the heat. Ideally the plate should be placed on a metal rack allowing you to heat it easily from underneath. If using a bunsen burner, or something similar, try to always keep the heat source moving in gentle circular motions to evenly heat the plate. You must watch the dust on the top surface of the plate very carefully as you heat the plate. At a certain point the colour of the aquatint particles and the surface of the plate will quite quickly change and appear somewhat more glossy at the desired heat is reached. As the change in colour occurs the particles of dust are melting and sticking down to the plate’s surface. You must make sure the whole surface of the plate has undergone this change then allow it to completely cool before handling. The effects achieved by an aquatint are similar to that of extremely fine stippling and the same problems can occur during the etching process. You may find that if left in the etching bath for too long an aquatint may start to lift of the plate as the metal below dissolves and becomes unstable. It is very important to keep a close eye on the etch and make sure too much lateral degradation does not occur. These principals are better explained in the sections above on ‘Mark Making’ and ‘Hatching’. When etching an aquatint the darkness achieved should directly correspond to the time it was immersed in the acid. It is important to note that you do not have to aquatint a whole plate and it is possible to aquatint certain sections. You can use hard ground in a liquid form to mask off sections of an aquatint. This process also allows you to achieve gradations in overall tone. To use this process immerse the aquatint in the acid, remove it then paint out the certain sections you wish to be of a lighter tone. The longer the immersion, the darker that section will appear. You can repeat this process many times to create gentle graduations in tone. It is a good idea to work out using a test plates what immersion time will give you a solid black and also to work out various tones in between. Using these tests you will be able to create almost any tone desired. Be aware that aquatints can also be created with a variety of methods including things as crude as simple spray paints that will also work on the plate as an acid resist. There are many options out there worth exploring though for a fine even result rosin is probably your best option. Using this technique designs can be painted onto the bare metal surface of a plate using a syrupy sugar solution. When this sugar solution has dried the surface of the plate is completelycoated in a liquid ground including the previously drawn image. Liquid soft ground is perhaps the best option for this. After the ground has dried the plate is placed in hot waterand perhaps also under a running tap. This exposure to water will dissolve the sugar solution and it will begin to lift off the plate bringing the ground above it with it. After a short time all the solution should have lifted off the plate and your original design should be completely exposed. This technique allows you to create fluid linesand large patches of tones that would be impossible with a scribe and other hand tools. This technique is perhaps best used in conjunction with aquatinting. An aquatint (as described in the section above) can be applied to the bare plate (but not etched) before the sugar solution is painted over the top. Using this method will give the marks drawn with the sugar solution a tooth when they are later exposed to the acid and thus giving those sections tone. An aquatint can alternatively be applied to the exposed sections of the plate after a sugar lift has been completed. Sugar lifts and Sugar lift aquatints are very interesting techniques that will allow you to achieve effects impossible with traditional hand tools. Sugar lift solutions can easily be made from a small number of simple ingredients easily available for purchase. There are manyrecipes for sugar lift solutions, some are very simple some and some have many ingredients. White ground or Soap ground is a liquid mixture that can be painted onto a metal plate for use as a ground. Unlike regular ground white ground is not completely acid resistant and acts as a timed stop out when immersed in acid. White ground will resist the acid longer in areas where it is painted on thickly while in areas where the ground is thinly laid the acid will bite faster. Using white ground on a plate in a variety of thicknesses it is possible to get gradations and many variations in tone. The results achieved with white ground are somewhat irregular however this irregularity is a chief principal of the technique and can create a variety of charming effects. White ground can easily be applied to the surface of a plate in a painterly manner with a brush or a variety of other implements such as a palette knife or dauber. White ground can also be worked back into after its application both while it is drying to create interesting textures and, once dry, scratched into with various implements including traditional etching scribes but also perhaps other more interesting tools. White ground can be used by itself to produce a complete plate with one application or it can be used as an under-painting with other grounds on top. White ground can also be very effectively used in combination with the aquatint process described in a previous section ‘Aquatinting’. The aquatint can be added to the plate either before or after the white ground is applied and manipulated. Applying the aquatint after the white ground process is perhaps a better option. The only problem with this method is that when applying the aquatint it can become quite difficult to see the particles next to the white ground. White ground must be left to dry before applying an aquatint or placing it in an etching bath. Because white ground slowly dissolves throughout the etching process the depth of an etch when using white ground is normally quite shallow. Because of this using it in conjunction with an aquatint to increase the bite on a plate is generally a good idea. The mixture for a white ground includes linseed oil, white pigment, soap flakes and water. When mixing white ground the soap granules and the white pigment are first mixed in the dry state. Next gradually add the linseed oil into the mixture. After this add the water until a soft paste is formed. The paste should be stored in a covered jar so the water will not evaporate. Because of the slight tendency of the oil to separate from the water the mixture should be stirred before each use. During use the consistency of the mixture can be varied by thinning with water. Chine Colléis a technique where a second sheet of paper is applied between the inked printing plate and your printing paper collaging it into the print. The secondary papers you introduce using this method can be intricately cut out, left as large sections, or both. You can create many interesting effects that can be both subtle and dramatic using this technique with both plain and pre-designed papers. As a general rulethe secondary paper you are using to Chine Collémust as thinner than the primary or backing paper that you are printing on and as well as this the thinner this secondary sheet is the better the technique will work. The key is experimentation, some papers will work well and some will not, you must try different mixes of papers to work out the good combinations. The technique works by first Inking your plate as per usual. The secondary paper which you wish to apply should be cut to the size desired and laid face down.The adhesive required is a solution of rice-glue and water mixed to a tacky-fluid consistency. When mixed well in a container, the glue must thenbe applied to the back of the secondary paper with a soft brush making sure to wipe clean any excess. Lay the plate face up on the press inked and ready to print as per usual. Carefully lay the glue-applied secondary paper on top of the plate in the desired position, making sure the side with the glue is facing up towards the ceiling. Next gently lay the primary sheet over the top and continue as if printing as per usual. The combination of glue and pressure should virtually fuse the papers into one. If you find that the secondary paper is not successfully sticking down to the primary sheet try applying a different amount of glue or altering the glues consistency during your next attempt. It is possible to ink up an etching or intaglio printing plate with a roller allowing you to print yourplate in relief. Printing a plate in relief will give you essentially the opposite result to that of inking your plate using a regular intaglio method described below in the ‘Inking your plate’ section. When normally inking an intaglio plate the ink settles in the grooves or valleys incised into plate leaving the flat surface areas of the plate free of ink. Alternatively when inking using a relief method the ink sits on these flat surface areas and leaves the grooves or valleys ink free. This essentially means that all the line work will appear white and every surface on the plate left untouched will carry ink. To achieve this relief result you must apply the ink to the plate with a rubber roller. Rollers come in a variety of sizes and If possible try and use one that is wider than your plate and with the widest diameter possible. This will allow you to cover the plate’s entire width with a single roll. The ink should be prepared as usual described below in the ‘Inking your plate’ section. Once the ink has been laid out, use a spatula to spread it into a line roughly as wide as your roller. Roll out the ink using your roller into a rectangular area on the glass being careful not to pick up too much ink. As you roll the ink out make sure to lift the roller at the end of every roll. This technique will allow the roller to continue spinning and help with consistency of ink both on the roller and the glass. Continue rolling until there is a light but solid supply of ink covering the rollers surface. With practice you will learn how much ink should sit on the roller not just by sight but also the sound of the roller as rolls across the inked up glass. If you find you have too much ink on the roller simply make the inking area of the glass bigger to better distribute it. Once you are happy with the amount of ink on the roller you must now apply it to the plate. Lay the plate down on a flat surface like the inking glass and with a fast steady roll away from you apply the roller to the plate. You may have to apply the roller to the plate several times. You must be very careful not to apply too much ink to the plate. The covering of ink on the surface of the plate must be as thin as possible while also being solid and consistent. If there is too much ink on the plate it will begin to seep into the grooves and valleys which will ruin the relief effect. If this happens the plate must be completely cleaned of all ink before proceeding. When the plate has been successfully inked and is ready to print it should be placed on the bed of the etching press in the normal fashion this is described in a following section ‘Printing your plate’. Be aware however that when running a relief etching plate through an etching press the pressure of the press must be substantially less than a regular intaglio print. If the pressure is not lowered the ink will most likely be squeezed out from the sides of the plate and also contaminate the etched grooves which will force you to completely clean your plate. Rollers must be cleaned of ink after use and their smooth surface can easily be ruined if not properly cared for. A Scraping and burnishing tool can be uses to removing lines, scratches and tone from the surface of a printing plate after they have been etched. The principal of scraping and burnishing is simple with the main objective being to flatten sections of the plate's surface to stop it from holding any Ink. This technique can be used to work back into sections of the plate that already hold tone to create lighter areas and highlights. Working over tonal areas such as an aquatint will allow you to achieve unique effects similar to that of a Mezzotint and unconventionally drawing with white on black.If aiming to work back into already etched tones you will normally not scrape the surface but just use the burnishing tool, this techniqueis described below. As well as these methods scraping and burnishing is primarily used to fix mistakes and unwanted lines. Scraping and burnishing tools can be purchased as separate tools or more commonly as a two ended tool with both features. The technique of scraping and burnishing can be divided into three sections: Scraping, burnishing and polishing. The scraper is a hard pointy tool normally with three strong edges. The aim of working with this tool is to use the hard sharp edges to slowly shave the surface of the plate down around the lines or marks you’re aiming to remove. Being very careful and accurate lie the tool almost flat across the surface of the plate and move the end of the tool side to side to slowly scrape away at the surface. The idea here is to gradually shave away at the surface of the plate to try and open up and flatten any areas you are unhappy with. Continuously stop and use your fingernail or scribe to probe the depth of the line or area you are trying to amend. Although you are trying to completely remove and flatten the area you are unhappy with you must also aim to keep the area you are working on with the scrapper as small and tidy as possible. Be aware that the deeper the line or blemish you are trying to remove the harder the task will be. It is possible to do significant and sometimes irreparable damage to the surface of a plate with a scraper and burnishing tool if used incorrectly so be careful. Once you are satisfied that you have scraped the surface of the plate to a depth close to flush with the bottom of the line or blemish you are trying to remove you must now utilize the burnishing tool to better flatten the area. The burnishing tool is a very hard and smooth implement shaped almost like the pad of a thumb. This tool is made of a metal far harder than that of the plate and because of this it is capable of smoothing the plate's surface if applied forcefully. This tool is used to rub flat the surface of a plate to remove any remaining tooth and gently mash the metal's surface as smooth as possible. To use the tool effectively its smooth rounded end must be accurately but forcefully applied to the plates surface with a strong downward pressure. Using small normally circular motions the toothed areas of the plate can be quite effectively smoothed. This technique is very effective but can take some time. Just like when using the scraper you should continuously use the pad of your finger and nail to feel if the plate's surface is satisfactorily smooth throughout the process. Once you believe that you have burnished flat the plates surface as much as possible you should now finish the process by polishing the area with steel wool and brasso then finally with a cotton rag. This final step is vital for fixing scratches and marks. Just like the other steps in this process you must use the brasso and steel wool accurately. Start fairly strongly with the steel wool and brasso slowly relieving the pressure over time and at the end swap the steel wool for a cotton rag and briefly continue. Notes on using brasso and polishing can be found above in the 'Polishing the plate's surface' section. Always remember to feel the plate's surface to gauge your progress in this stage as well as others. In all stages of scraping and burnishing you must keep your mind on the surface texture of the plate and how it feels not how it looks. You will find when trying to amend scrapes and scratches you will have to make a print to see if you have completely fixed the area. It is not uncommon to have to go back to the scraping and burnishing stage several times to find success. Remember to completely remove all traces of brasso with a solvent before printing. It is also a good idea to again degrease the plate after this procedure. See the above section ‘Degreasing the plate’ for further details. Acids used for etching metal plates can easily cause damage to your health as well as ruining clothes and equipment. Always read detailed instructions and follow safety procedures when dealing with acids and chemicals and dispose of them properly. Different metals require the use of different acids for etching. For etching Copper plates one of the best options is Ferric Chloride which can be obtained from some art shops as well as chemical supply companies. Ferric acid solutions can purchased from some art shops in a liquid form ready to use or bought as a concentrate that will have to be diluted. One technique of mixing your ferric solution is called the ‘Edinburgh Etch’ and is probably the easiest and best method. The ‘Edinburgh Etch’ is mixed together from a few ingredients listed below. If you are mixing up an etching bath for the first time try and find somebody with experience to help you through the process. There are many helpful articles and videos on the internet which can provide much useful information and descriptions of exact procedures and safety etc. Ferric can be mixed to different strengths which will directly affect the speed of reaction times and the time your plate will need to be immersed in the acid bath. Citric acid, in a small quantity, should also be added to help with the chemical process of diluting the copper. The citric acid is not vital for the etching process to take place, but will aid in the dilution of the remnants of the initial reaction with the ferric and should give you a better result. Ferric etching solution should be kept in plastic baths that should always be covered when not being used. A ferric solution can be reused many times but it will become weaker and weaker as it is used to etch more and more plates. Ferric solutions can be stored for long periods in sealed plastic containers. Ferric baths tend to be quite messy and destructive to their immediate surroundings. If you are etching from home in your own bath always know what you’re doing in a designated space suitable for the role. The depth of the etch on a plate is directly related to the time that the plate spends submerged in an acid bath and subsequently relates to the darkness of the line created on a page.A magnifier can be used to see the depth of an etched line and gently probing these lines with a scribe can also help when determining their depth. It is very difficult to see how deep a line is with just the naked eye. When you take the plate out of the acid rinse it off with water then closely observe whether the etch is sufficient, if not simply place it back in the bath for longer. Different types of images and lines will require different times in the acid. Ideally marks should be as deep as possible before any kind of lateral corrosion is evident in the lines and they become furry. As lines etch deeper and deeper into your plate the acid will also start to burn sideways as well, creating tiny overhangs under the ground. If etched for too long, these tiny overhangs can collapse and destroy the subtle crispness of some lines as well as wreaking havoc on fine sections of hatching. There is always a perfect time to remove a plate from the acid and by numerously checking and observing your plates throughout theetch you will soon learn what signs to look and feel for. Using a test copper plate is a good way of working out the amount of time an etch should last. By testing a number of uniform lines on a plate by submerging each line for different specific times and recording them in a log you can directly correspond etching times to depth and thus darkness of a line when you print them. This can be a great aid to knowing the results you will achieve but be aware your recorded times will gradually change as your acid gets older and weaker and will not necessarily correspond to other acid baths. Copper-Plates can be etched both face-down and face-up in ‘Ferric Chloride’ acid. Acid baths should be in a dedicated area and can be quite dangerous so be careful when dealing with them. The Acid Bath should be a plastic tray in a ventilated area and gloves and goggles should be worn when dealing with them and moving plates in and out. Acid baths should always be covered over when not in use to stop acid evaporation and to stop things falling in. Face-up is probably the simplest and best approach to etching a metal plate. The plate simply lies on the bottom of the bath with the image facing up completely submerged in the acid solution. When etching a plate face-up the particles that are created during the etching reaction can become clumped and stagnant in the plates grooves. It is good to remove the plate from the bath about every 10 minutes and rinse with water to remove the etched sediment from the lines and keep them crisp. The plate can be returned straight into the acid and this is also a good way to see the process of your etch. Plates are etched face-down to allow the sediment that is exhausted from the etching reaction to clear the area of the bite and fall to the bottom of the bath. To etch a plate face-down ceramic tripods are used to raise the plate up from the bottom of the acid tray. Place a number of tripods in the acid and allow your plate to be supported by them face-down with no section touching the bottom of the bath. When placing plates in the acid bath slide them in gently and try to make sure no bubbles are caught on the face of plate as those areas will not etch properly. As well as this, be careful not to scratch the front of the plate with the tripods as you maneuver the plate on top of them. It is important to set up your printing area correctly and completely in order for a smooth and trouble free printing experience. Areas should include the inking area, the paper preparation area and the printing press. It is quite easy to ruin a print and cause unnecessary work by contaminating areas with Ink from dirty hands and equipment. All printing areas should be as close as possible to each other without them being so close contamination can occur. The paper and press areas should always be dealt with using clean hands and the best way to do this is by using disposable gloves at the Inking station which can later be easily removed. Disposable gloves are a huge aid when printing and will allow you to work a lot faster as you will not have to wash your hands between the inking and paper stations. You will find when editioning prints you will go through many sets of gloves so make sure your studio has a good supply. There are other options such as using tabs to pick up papers with dirty hands but they are not ideal, it is always best to keep clean and tidy. When inking up a plate you will often find that you will not only get ink on your hands but often your front as well so is always a good idea to wear an apron. Always have rags, detergent and a cleaning agent like turpentine with you at your printing station at all times. To make sure prints are correctly lined-up or ‘registered’ with the paper you're printing on requires the use of a registration or 'rego' sheet. This thin sheet of paper should be at least the size of the paper you wish to print on and have drawn on it the outline of the paper you are going to print on and the outline of the plate. The rego sheet is vital in the placement of the printing plate on the paper and it is worth using one for all serious prints. The registration sheet should be ruled up as accurately as possible using a ruler and ideally a set square. It is well worth spending the time creating a good, accurate registration sheet. The rego sheet should be placed under a sheet of thin plastic so you can easy clean it when excess ink is left on the bed after printing. When you are ready to print, the plate and the paper can be directly laid on top of your template. The rego sheet should be laid as close as possible to the center of the press bed as possible. There are many different types of paper available that are specifically designed for etching. Paper can be purchased in individual sheets or even whole reams and substantial discounts can be obtained if buying in bulk. The best and most common are papers for etching are 'rag' papers consisting of 100% cotton fibers. As well as coming in a variety of sizes, paper also comes in a variety of thicknesses known as 'weight'. The weight of a paper is measured in 'gsm' or 'grams per square meter' and the higher the number the thicker the paper. Most average papers range from about 200 to 600 gsm. Generally the higher the gsm the better the paper will perform but the more you will pay for it. It is also worth noting that many papers of the same type will be available in a range of weights. Between brands and makes, the surface of papers can also vary quite dramatically, from quite hard and flat finishes to soft and furry. As well as this, etching papers can range dramatically in tones and colours and there is a large variety available from stark whites to warm crème finishes and also in some cases even coloured paper. 'BFK reeves' is a good example of a harder, starker white paper while 'Hahnemühle' is a good example of a common paper that provides a softer, fuzzier and creamier finish. In nearly all cases the paper's brand can be seen watermarked somewhere on the sheet of paper in writing or logo form and this can be found by holding the paper up to a light source. This will also help you to identify the front and back of the paper with the front being the side that makes the watermark readable. The front side of the paper should also feel very subtly different than the back and ideally this is the side that should be printed on in most cases. Understanding and seeing the subtleties in paper takes time and experience and unless performing special techniques such as 'chin-collie' or 'hand-colouring' there is no real right and wrong when selecting a paper, it is a personal choice of taste. It is very good idea to take a sample of your off-cuts of each type of paper you use, labeling them and filing them away. Eventually you will build very handy selection for future reference. It is good to experiment with a wide variety of papers and to take note about what you like and dislike about them. Most printmakers eventually become fond of a few particular papers for particular applications but this will only happen through practice and experimentation. As a general rule all paper used for etching needs to be dampened with water to help with its absorption of ink from the plate’s surface during printing. Depending on the type, paper can be wet to a variety of degrees but most paper specifically designed for etching needs to be completely soaked in a water bath and then padded dry. When soaking etching paper in a water bath use a tray that can hold water to a few centimeters deep and that can completely submerge your paper. The dimensions of the bath will obviously have to be larger than that of the paper being used however many sheets of paper can be placed in a single bath on top of one another. Make sure the bath, as well as the water in it, is clean and refreshed every day. The soaking of paper generally should not be less than fifteen minutes but most papers can withstand a soaking of up to a full day. Depending on the make of paper and its gsm generally a few hours is ideal. Paper that has been soaked must be towel dried to remove any surface water before printing. Making sure you are in a clean space with clean equipment, lie one towel down on a flat table making sure there are no creases in it and then lie the paper over the towel. Use a second towel to lie over the paper and dab dry with your hands with a gentle motion being careful not to bruise the paper underneath. You may have to remove the upper towel, flip the paper and repeat the process to completely dry the paper on both sides. The aim is to remove any surface water from the paper and by dabbing the paper until the glimmer of water from the paper's surface is removed the task is generally complete. Paper should finish this process damp, not dripping wet. Remember to hang your towels up on a rack to dry between prints to prevent them from becoming too damp and useless. Alternatively, it is also possible to wet paper with a spray bottle before dabbing dry. This technique of spray wetting is only recommended when using papers of a very low gsm or papers not specifically designed for etching. These papers not designed for soaking may become weak and even begin to fall apart if they take on too much water in a bath. Experimentation is the only real way to see what is suitable for specific papers but in general etching papers should be bathed. Paper being used for a print or a print run should be cut to size before being placed in the water bath. It is a good idea to cut all your paper to the correct size when making a rego sheet, especially if printing an edition. If you are printing an edition or a number of prints make sure all your paper is cut and in the bath before you start inking and the printing process to avoid contamination. Etchings, and all intaglio print methods, require the print press to be set extremely tight as to squeeze all the ink out of the grooves of the printing plate and onto the paper. The press has several important parts including the bed (the slab the paper and plates lie on), the rollers,a thin plastic sheet, and also the feltblankets whichhelp to distribute the force applied by the rollers to the plate. If there ismore than one blanket the thinner one should generally lie below the thicker and they should be lined up as square as possible with the press bed. On top of the press bed but below your blankets you should have a thin, clear sheet of plastic. This allows for easy cleaning of the press bed after every pass through the press and also gives you something to fix your registration sheet under. This rego sheet should be placed as much in the center of the printing bed as possible and it will show you exactly where to lay your print and paper. Once this is in order the pressure of the rollers must be set by screwing them downwards with the two handles on the top of the press. A good way to set a press is to place the plate you wish to print, or plate of the same thickness, under the felt and move it under the rollers. Turn both handles tighter, and keep going until they become very stiff. When turning the handles try at all times to turn them in unison as best as possible. Roughly, the handles should be turned as tight as your wrists alone can get them and try to make the pressure equal on both sides. The only real way to test if a press is tight enough is to try a print. If the plate is inked correctly but appears too light or mottled in colour the press could be too loose, try to tighten the press for the next print. If the paper rips, ink splats-out from the print or you find it very difficult to roll the plate through the press, you may have your press set too tight.Through experimentation and practice you should be able to achieve a good result when setting your press. Some presses also have gauges on them to measure the pressure applied on each side of the roller, these are a great help and good guide but do not completely rely on them. When dealing with ink it is a good idea to wear disposable gloves at all times which can easily be removed to avoid contamination and grubby marks on your paper etc. Remove the ink from the tin or canister into a small pile on a clean glass sheet. Be aware that ink’s viscosity can change dramatically with temperature and handling. Manipulate, cut-up and roll the ink with a spatula or likewise on the glass while trying to keep the area you're working in as small as possible. Work the ink until it is soft and consistent and if any hard bits or chunks are discovered remove them with a knife. While holding the plate in the palm of your hand, use a cardboard tab (or equivalent) to gently spread ink across the whole face of the plate. Once the whole plate is covered, use a fresh tab, or another edge of the same tab, with a similar action to remove as much of the applied ink as possible. Remember to try not to scratch marks into the copper-plate at any time during this process. Once as much ink as possible is removed with the tab, use a tarlatan rag to gently rub, ideally in gentle circular motions, more and more ink from the plate. The more a plate is rubbed back, the more defined the print will appear and the blank sections appear whiter. Once you have rubbed enough ink from the plate to quite easily see the image desired, continue rubbing the plate in a similar manner to the tarlatan but using paper such as news-print (ripping out individual pages from an old phone book is perhaps the best option). When the sheet of paper you are using becomes black with removed ink, swap it for a new sheet. Try and keep the palm of your hand as flat as possible while rubbing to achieve an even result. It is acceptable to stop rubbing back the print before all the ink is removed from open, fat sections of the plate in order to achieve a ‘dirty’ looking result, this can be hard to replicate in an edition however it can often be a quite charming result. For a clean, crisp print continue rubbing the plate back until all ink is completely removed from all the flat, open surfaces of the plate. At all times try to use a flat, even hand and be aware of over-wiping the ink out of the etched depressions on the plate. The last action of wiping a plate should be to run down each edge to remove all ink. It is possible to continue using paper for this process but is sometimes better to carefully use a cloth. Make sure your printing press is completely set ready to print- See previous section 'Setting the Press' and all preparations have been made detailed in previous sections before starting to print. Your press bed must be wiped clean before every run through the printing press as one speck of ink can ruin a print, you should also wipe it down before your first print. Place your plate face up on your press bed exactly on your rego sheet - See previous section 'Registration' for making and setting a rego sheet. Remove your paper from your water bath and dry off with a towel - See previous section 'Preparing your Paper' for details on wetting and drying papers. Place the dried damp paper over the plate being very careful to align it with your rego sheet. Try and drop or lower the paper over the plate in one gentle motion starting from one of the corners of the paper. Once the paper is lying over the plate it is a good idea to place a secondary sheet of larger paper over the top of the original sheet. This secondary sheet is not completely vital for the printing process but will help in not damaging and wearing out the felt above and to absorb any excess water still left in the original paper. This extra sheet should just be something cheap and of low quality such as news print or cartridge paper. Just like the original sheet make sure this paper lays flat with no creases. Once all this is lying flat gently lay the felt or felts down on top of them and softly pad flat making sure there are no creases or folds in the felts or paper below. When turning the wheel on the press the key is consistency and to keep an even speed the whole way through. If the press is set correctly you should feel a bit of a bump as the plates leading edge goes under the rollers and again as its back edge passes through. Especially on a small, ungeared press, the pressure on the wheel will increase as the actual plate goes under the rollers. If you find it extremely hard to pass the plate under the roller it is possible you have set the press to tight. It is possible to tear your paper and even your blankets if your press is set too tight so if extreme resistance is felt while rolling it is best to retreat and reset your press. It is also possible that the press is not set tight enough; this can be detected by lighter than desired, almost faded looking prints that you know are sufficiently inked. You must make sure both your plate, paper and a little bit extra have passed under the roller before you stop rolling. When you are sure of this it is time to pull up the felts and lift the paper off the bed. Lift the felts and fold them to rest over the rollers to expose your paper. Remove the secondary sheet of cartridge paper gently to expose the primary sheet you have printed on. Making sure you have clean hands, holding the paper at a corner in one motion lift it from the press bed. Marvel at your image and place it in an area to dry. Lift the plate from the press bed and clean the bed underneath it to ready the press for the next print. The best way to dry your prints after they come out of the printing press is to lay them flat between two flat boards. Cork boards are ideal but any wood in sheet form should be sufficient. You must place a sheet of paper such as newsprint on each side of the prints to avoid marking them and to allow for some of the water to be leached out as they dry. If possible the print should be left like this for several days and ideally the papers on each side should be changed as the print dries. If you dry your prints on a drying rack because of the large amount of water trapped in the paper you will find they will buckle as they dry. Drying racks can be used initially but be sure to press them flat shortly using afterwards the first method if possible. Most etching inks will be touch dry in a number of days but If you are framing or continuing to work on your print with a technique such as hand colouring wait at least a week before proceeding to avoid problems. It is important to properly clean up after a printing session to ensure good printing next time and the longevity of you equipment. Substances like turpentine will effectively clean most tools and equipment but there is normally a safer and less toxic option such as oil, even cooking oils can be quite an effective choice. Always have a supply of rags handy in your printing studio; these rags will be useful for cleaning just about everything. When finishing up with your printing session collect the excess ink from your inking table with your spatula and if possible place it back into its corresponding ink tin. Be sure to thoroughly clean the surface of your inking table with either an oil or turpentine to remove all traces of ink. Press beds should always be kept as clean as possible and wiped down with a cleaning oil or turpentine and Windex after printing. Do the same for your tools and pieces of equipment such as spatulas and rollers. Cleaning can be a bore but you will thank yourself later when you next start printing in a clean and tidy studio. A good set up of cleaning equipment for your studio should include rubber gloves, a large supply of rags, turpentine, cooking oil, regular detergent and Windex. Hand colouring is a method of colouring your prints by hand after they have gone through the press. This method of adding colour to your prints can deliver beautiful results and a unique aesthetic. Hand colouring is normally achieved with watercolor paints. When hand colouring prints must be completely dry to avoid smudging the existing printed work on the page, see earlier section ‘Drying your prints’ and it is a good idea to use high quality water colour paints for the process. Printing ink is generally oil based and, once dried, will not be affected or smudged by water or water colour paints when added to the print. Because of this you can colour in the print without worrying about blending the existing printed lines and tones with the colouring work you are adding. The printing ink already on the page should slightly resist the water based colours being laid on top. This normally will work to your benefit allowing the previously printed lines to keep their strength without being dulled by added colour. When using water colour paints to hand colour the best results are perhaps achieved when using light washes - colours whose pigments have been quite diluted in water. This will among other things help keep the strength in the underling printed lines. If trying to achieve a strong colour it is often a good technique to lay several layers of diluted pigment on top of each other, after waiting for each one to dry, rather than simply painting it all on in one go. Be aware that certain water colour paints are opaque not translucent, for example white,these colours will generally give you a bad result when hand colouring. The level of opacity of a water colour paint is generally marked on the paint tube. If prints are part of an edition they can quite hard to perfectly replicate. No two hand coloured prints will ever be perfectly the same, but it is possible to get them pretty close. When hand colouring decide on your complete colour scheme before you start and be aware that if you can avoid blending colours on the print to much the task will be far easier, especially for uniformity. It is a good idea if colouring a number of prints to lay all your prints out and colour them all at once, colour by colour, and section by section. Colouring like this will allow for better uniformity. It may feel like a repetitive and daunting task but overall this method is quicker and more accurate. Before starting be sure to mix enough paint to complete all prints and also be aware that water will evaporate from water colour paint mixtures from their containers over time subtly making them darker. It is possible to fix small marks or blemishes on prints once they have gone through the press. This is best done with a sharp blade when the print is completely dry. Lay the blades edge as flat as possible across the dry paper and with a gentle side to side movementuse the sharp edge to shave the surface of the paper off. As you scrape away at the paper with the blade brush the small amounts of fluff created away with a soft brush. This technique is for use amending small blemishes such as specks of ink and small smudges. It is very hard and generally a bad idea to try and fix anything much larger in the post printing stage. These processes must be performed slowly and delicately to be effective. By rushing or being imprecise it is easy to damage your prints even further so be careful. If your prints become crinkled and need flattening see the previous section ‘Drying prints’ for some techniques to fix these problems. 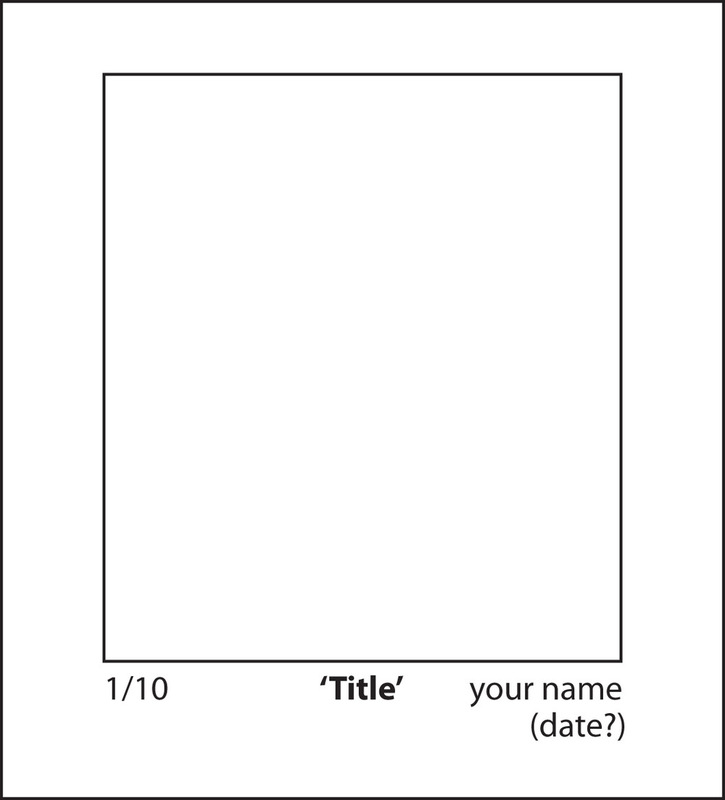 If the print is a ‘Bleed Print’ (the printed area is larger than the actual paper being printed on) use the same conventions but write either along the bottom of the image or along the bottom edge of the reverse side of the paper.